Northmor’s district semifinal match with Newark Catholic at Buckeye Valley didn’t get off to a good start, but the finish was more than enough to make coach Kara Wright happy. After losing the first set 25-11, the Knights bounced back to take the next two by scores of 25-21 and 26-24. 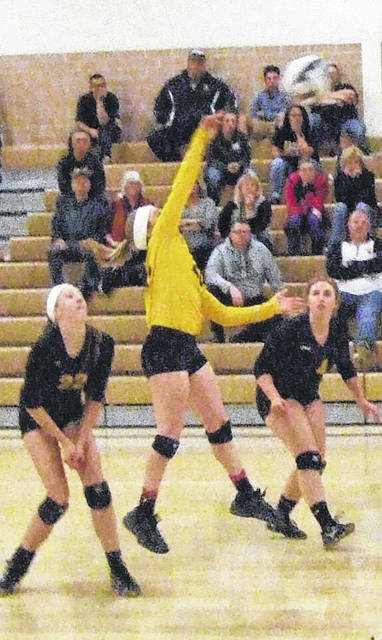 After falling 25-17 in the fourth, Northmor closed the match strongly, winning 15-11 in the deciding fifth game to move on to Saturday’s district finals match-up with Marion Pleasant. All in all, a great comeback from an inauspicious start that saw the Knights get out to a slow start and then get overwhelmed down the stretch in suffering a lopsided game one defeat. Northmor turned the corner early in the second game. After falling behind 6-1, the Knights got a defensive pot and Anna Donner then served for two. With the score 12-8, they would get four straight points from Kelsie Fike to tie the score. Jordyn Zoll, Donner and Hanna Bentley would each pick up two points, as the locals surged ahead by a 21-17 margin and Northmor would hold on to knot the match at one game apiece. The teams would battle back-and-forth in a tightly-contested third game. Zoll gave Northmor an early lead with two quick points, but Newark Catholic would move past them to take a 12-8 lead. A defensive point and four straight by Fike brought the Knights back in front and three points by Zoll made the score 17-14. The Green Wave immediately came back with a defensive point and then tallied five on offense to regain the lead, but Donner fired back with three straight before NC got a stop to deadlock the game at 21. Newark Catholic would move in front 24-22, but game point was elusive. Northmor tallied a defensive point and Lily Tate scored on three consecutive serves to give the Knights a 26-24 win. Fike immediately gave the Knights a 2-0 lead in the fourth game, but their offense wouldn’t get anything going in their next four service attempts, as the Green Wave exploded to take a 15-6 lead. After a Northmor defensive point, Cristianna Boggs would score three in a row to keep the Knights in it; however, they would not be able to get any closer as their opponents held on to send the match to a decisive fifth set. Once again, Northmor took the early lead, as Fike served for three straight points. NC would battle back to take a 9-8 lead, but the Knights stopped their momentum with a defensive point and then tallied four straight on Boggs’ serving to go in front 13-9. The Green Wave was able to stop the bleeding with a stop, but would not score on offense the rest of the way, as the Knights were able to close out a dramatic win to send them to their first district final in Wright’s nine years as head coach. 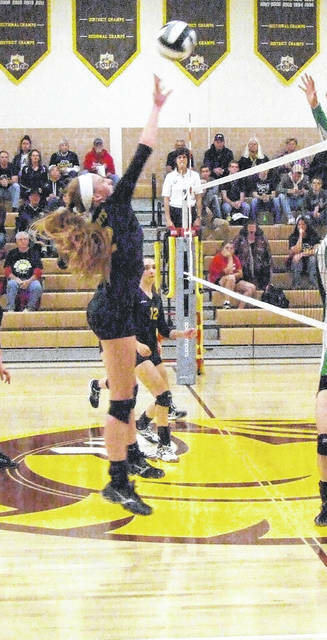 Anna Donner goes up for a kill attempt in her Northmor team’s thrilling five-set win over Newark Catholic Tuesday. Northmor’s Cristianna Boggs hits the ball in action from Tuesday night’s district semifinal win.